Electro Tech Powder Coating Powder Coating Services From Electro Tech Finish, Preserve and Protect Your Projects! When it comes to finishing metal products, powder coating is by far the most even, durable and eco-friendly option available. Unless you are already in familiar with the concept of powder coating, you may not realize that you see powder-coated items every day, such as bicycle frames, playground equipment, fences, patio furniture and more. If you wondering what is the powder coating process, you are not alone. In fact, most people assume that objects are painted, when they are, in fact, powder coated. 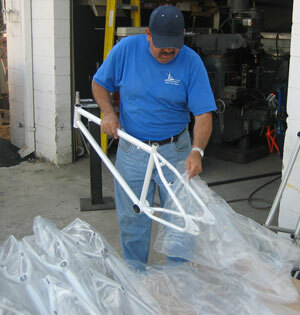 The powder coating procedures may seem complicated, but it is actually a fairly quick and easy process. Basically, the metal object being coated has a positive electrical charge. When it is powder coated, it is sprayed with a special colored powder that has a negative electrical charge. This makes the powder stick to the item evenly. Then, the powder is heated, and through a chemical reaction, the powder melts to form a solid, even coating that is resistant to fading, chipping or scratching. What Services Does Electro Tech Coatings Provide? For nearly 20 years, Electro Tech has been providing comprehensive powder coating services to the entire southern California area. From commercial production runs for metal fabricators and manufacturers, to the smallest jobs like bicycle frames or bird cages, we deliver superior custom powder coating for our clients. We also provide thermal barrier coating for automobile exhaust systems, which helps boost performance by keeping under-hood temps down as well as preventing corrosion. As a family owned and operated business, we have expanded operations to include two shifts of full-time technicians, ensuring that projects have quick turn-around without sacrificing quality. Whether you are new to the process and simply want a custom powder coat for your bicycle, or you are a metal fabricator who wants to learn more about our large batch oven for production runs, we are happy to help. Contact us today to learn more about how Electro Tech Coating can help you with your project.